The Terrace Planters from Satu Bumi’s Standard Range of GRC Planters & Bowls are sturdy, well finished and competitively priced. 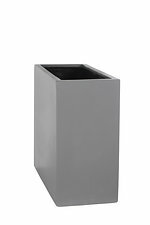 The Terrace Planter is a tall, wide and narrow rectangle planter specifically designed for balconies and terraces that have limited width available for planters. Therefore, you will notice in the product sizes below that the depth of the planters has been highlighted because that dimension will typically be the most import measurement for a terrace planter. These planters come in four sizes and have limited nesting options. Each planter is available in both raw concrete and a number of different old metallic and old stone oxide colours that provide a traditional and appealing aged appearance. Quality paint finishes are also available in virtually any colour.